The Solo6 Be monitor will surprise you in the very first minutes you spend with it, partly due to its size/extended bass response (40Hz at -3dB). The 6.5" “W” composite sandwich mid-woofer combines neutrality in the midrange, fullness in the midbass register and bass control. 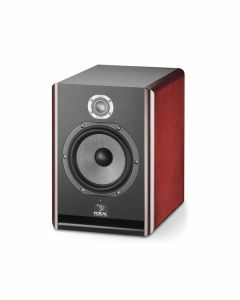 Focal’s Solo6 Be monitor will astonish you from the first moment you spend with it, partly because of its size/extended bass response (40Hz at -3dB). The 6.5" “W” composite sandwich mid-woofer mixes neutrality in the midrange, fullness in the midbass register and bass control. Its compactness and the choice of a large front laminar port ensure simple integration in studios that need a near field monitor without any acoustic compromise. The user settings on the back of the Solo6 Be, combined with its compactness, make it easy to carry and to adjust according to the acoustics of each studio. The Solo6 Be mixes the same components as Focal's highly respected three-way Twin6 Be but in a compact two-way design. As was the case with the Twin6 Be, users will be astounded by the Solo6 Be's lucidity and the extended frequency response. It extends from 40Hz up to 40kHz, above and beyond the range of human hearing. A particularly useful feature of the Solo6 Be, though, is that when you amalgamate its wonderfully neutral sound with its small size and user-adjustable rear settings, you've got a reference monitor that you can feasibly transport from studio to studio, tailor to a room's acoustics and dependably record/mix/master translatable tracks. A feature for which Focal has gained notoriety is the inverted-dome tweeter - it's a key factor in the magic internals behind the Solo6 Be’s outstanding performance. The specific advantage of the inverted dome is that it augments the mechanical coupling between the voice coil and the dome. Because the voice coil is fixed at mid-height on the dome, it’s capable of evenly moving the Solo6 Be’s entire cone surface. This design delivers innate high efficiency, accuracy, and energy, all resulting in a tremendously detailed soundstage. Of course, the Solo6 Be capitalises on that to full effect by employing an aluminium/magnesium alloy for the tweeter material. The Solo6 Be also capitalises on Focal's "W" composite sandwich cone. The inimitable characteristics of the cone permit optimisation of the frequency response curve, thanks to the total control of three key parameters: lightness, rigidity, and damping. The sound is breathtakingly transparent, has an excellent phase response and an extremely low distortion rate. Adjustable tweeter and woofer levels with potentiometers.